Blackburn with Darwen Council has today revealed the artwork concept that will become the centre piece of the new Darwen Market Square. A majestic Peregrine Falcon, made of woven copper, will arrive in Darwen this spring. 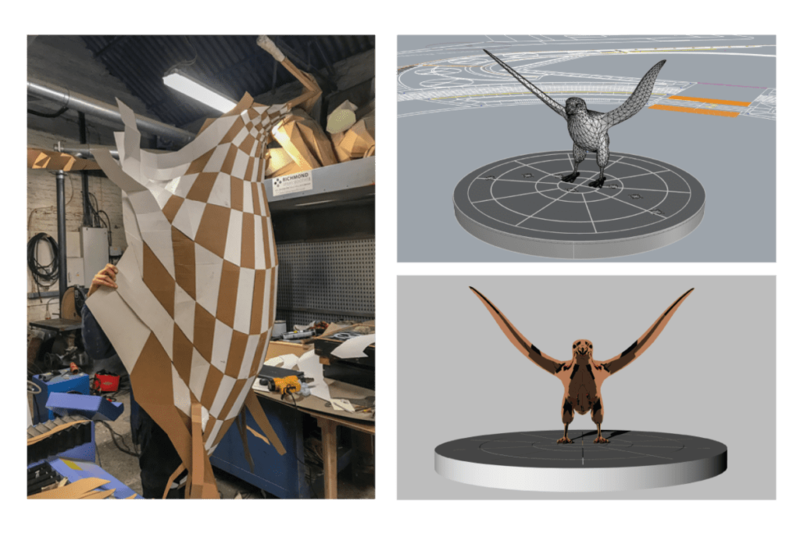 It will stand over 3m tall, with a wing span of 4.5m; it will look towards one of its inspirations the Moors surrounding Darwen. Renowned artist Liam Hopkins has been developing the artwork since summer last year, following community engagement sessions with over 300 people in Darwen. Liam asked the public questions about Darwen, themselves and their relationship with the town. He then collated this information and began developing ideas before the final concept was decided upon. “I want to thank the people of Darwen for being open and honest. Their stories and spirit have helped me to come up with this idea. It reflects the heritage of the town with weaving being one of the traditional trades. The idea of the bird also relates directly to Darwen’s surroundings with the Moors and the iconic India Mill. There is actually a family of Peregrine Falcons nesting in the tower there. Liam has been working in his Manchester based studio, to come up with the right techniques to weave copper in to the 3D falcon shape. He began with paper weaving, before creating a life sized cardboard model. Once works on Darwen Market Square are completed, the bird will travel from Manchester to Darwen before being lifted in to its new home. The official opening of the Square will welcome the beautiful Peregrine Falcon to the town, in a spectacular way. Information will be coming out soon about how you can be involved. Liam continues to work on artwork for the windows within the wall under Railway Road. This artwork will soon be revealed, but what we can tell you is, that, it is going to have very special significance for Darwen’s Heritage. The artwork is part of the £1.9 million pound Darwen Market improvements and public realm scheme that Blackburn with Darwen Borough Council is delivering in Darwen. The site of the former 3 day market is being replaced with a new public square at the heart of the town centre. It will have planted and seating areas alongside space for events.